Now in its’ 29th year, the Burning Man festival caters to environmentalists, neo-hippies, and artists who come together for a week of community, self-expression, and “leave no trace” self-reliance. From a small group of friends in 1986, to over 65,000 participants in 2014, Burning Man has grown to become the premier event for today’s counter-culture. The origins of Burning Man began with a bonfire that took place on the summer solstice of 1986, when Larry Harvey and Jerry James – Burning Man’s co-founders – staged the burning of a wooden man and a small wooden dog. Inspired by sculptor Mary Grauberger’s solstice events that took place at Baker Beach, California, Larry and Jerry built an 8-foot wooden sculpture for their 1986 event, followed by a 15-foot sculpture in ’87, and a 40-foot sculpture in ’88. By then, followers were calling these effigies “The Man,”and the name has been with the event ever since. For the first few years of the festival, the community spread by word of mouth and all who survived the rough desert terrain were considered participants. There were no tickets sold, no scheduled performances, and few rules. 1991 was the first year Burning Man had a legal land permit, and by 1993, Burning Man had given rise to a separate event called Desert Siteworks, which featured art and performances over a number of weeks. The Siteworks lasted through 1995. The following year, the art, performances, and ideas of Desert Siteworks had merged through a formal partnership with the effigy-burning event, and the “Burning Man” name was official. Today’s Burning Man festival takes place in the Black Rock Desert of Nevada from the last week in August to the first week in September. Participants are charged with creating Black Rock City, a thriving temporary metropolis which includes city planning, infrastructure, and community services to ensure safety, fun, and sustainability of the event. One of the aspects of Burning Man that draws world-wide participants, is the ability to create larger-than-life installation art. Without the limitations imposed by museums and other artistic venues, artists are encouraged to bring their visions to life – all while being supported by the community. Many artists participate as part of a team (called theme camps) where members collaborate to create a piece at Burning Man that fits with the event’s theme of radical self-expression, as well as the year’s festival theme. One such theme camp is Fire in Balance, which is focused on building community and enhancing the Burning Man experience through art. Each member of the team is encouraged to take part in the experience by sharing their expertise, taking risks, and collaborating on ideas. Focus on a central project is the way to ensure that everyone remains engaged. For 2014, the team collaborated with Poetic Kinetics, a Los Angeles-based group of artists that focuses on large-scale installations that make use of technology and experiential designs. Based on prior installations involving concept, designs, and building, Poetic Kinetics had the experience and manpower to bring the Fire in Balance sculpture to life. The idea was simple: to create a unique opportunity for Burning Man participants to view and interact with fire, while literally turning the experience on its head by inverting flame and taking “control” out of the viewer’s hands. The sculpture itself was formed using an inverted fire box suspended within a pagoda-like steel structural frame and surrounded by a series of dishes and towers which also held flames. Despite this simple idea, turning the team’s vision into reality was a bit more involved. Metal fabricators, architects, engineers, and design experts all had important roles to play in this creation, and hundreds of hours were devoted to the project. Like any large project, the most important part of this piece was the external structure. At Lasernut, we have a reputation for exploring and pushing the boundaries of technology, and we were brought in to use our laser cutting expertise to create the mysterious and engaging aesthetic structure that would contain the fire. The entire structure was clad in a laser cut facade and Lasernut also helped with bending sheets of metal to create the external pagoda. The design itself consisted of laser cut steel, with patterns generated by the Fire in Balance community. By using laser cutting, we were able to cut an intricate and precise pattern that would have been impossible with using any other manufacturing method. The end result was a structure that was 17-feet tall, 28-feet wide, and 60-feet long. 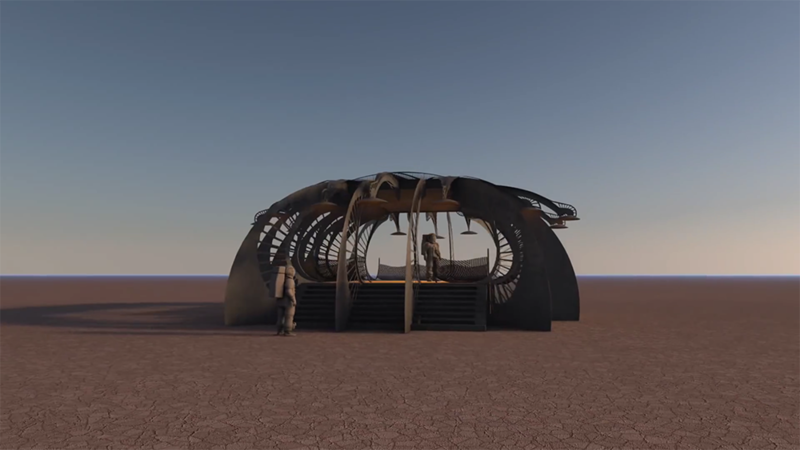 Fire in Balance could hold up to 70 people at a time and provide a place for Burning Man participants to perform, gather, and be at one with the fire. We were proud to be part of the Fire in Balance project – another victory for laser cutting! A video showcasing the project! Another video from inside the structure during the event!